omnomalicious | Om Nom Nomalicious recipes! In case you’re wondering, I am alive. I’ve just had my hands full with the new addition to my family. 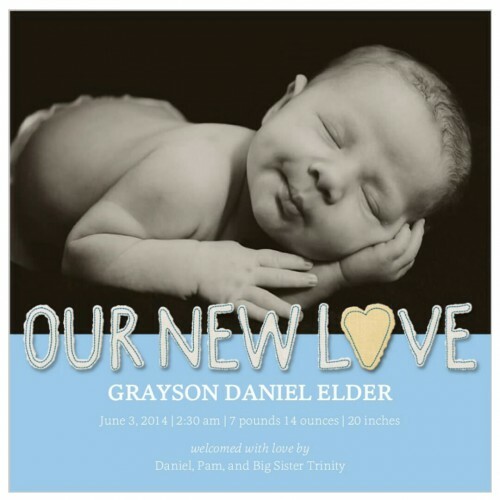 Grayson Daniel was born at 2:30am on June 3rd. He’s perfect. 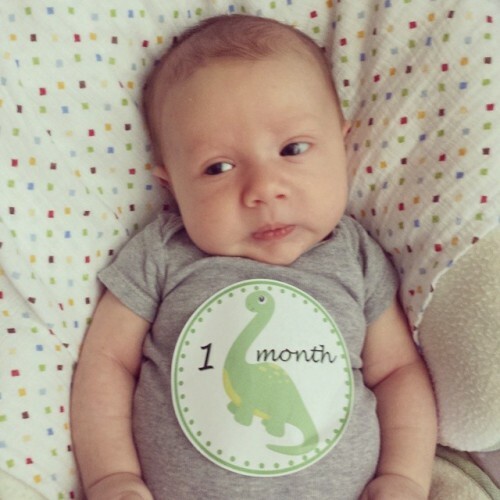 I am aware that he was born over a month ago, and that I have failed to announce it here. He’s kept me pretty busy, and I’ve been drowning in a bit of postpartum depression. Thankfully it was caught early, and I was able to get treatment right away. I’m feeling a lot more human already, and I’m able to fully enjoy my adorable little dude. Of course I can’t post without including a recipe, right? 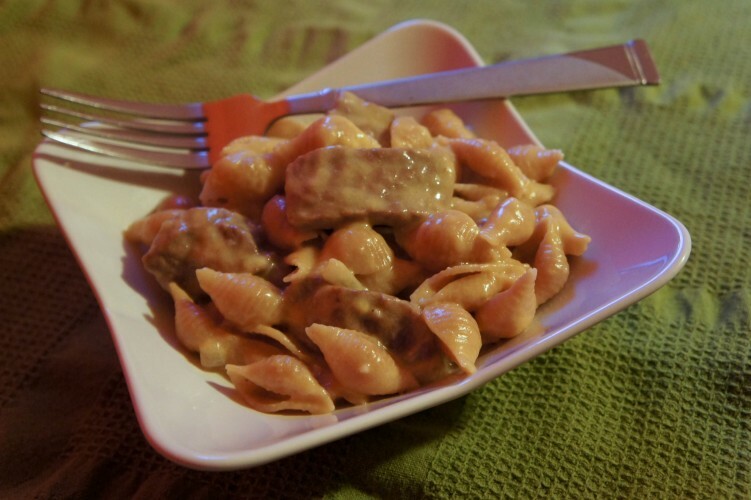 I owe you guys… so I come baring one of my family’s favorite meals. I’ve had a few people ask for this recipe, and I’ve been meaning to post it for months now. I’m finally doing it! 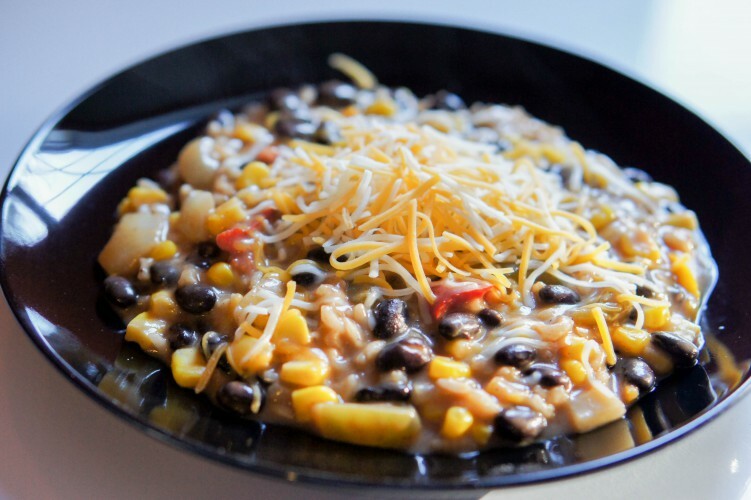 I adapted this recipe from Domestic Superhero’s Cheesy Veggie Enchilada Skillet Rice. She has some amazing recipes. So, make sure you go check out her blog. I did change a few things in the recipe. The most important one is changing it from using cooked rice to a one pan meal. I’ve been trying to make one meatless meal per week, and this is the one my family has been asking for most. We seriously love this, and I hope you do, too! Heat the olive oil in a large skillet. Add the onions and peppers and cook until onions are translucent, about two to three minutes. Add the rice and cook for another minute. 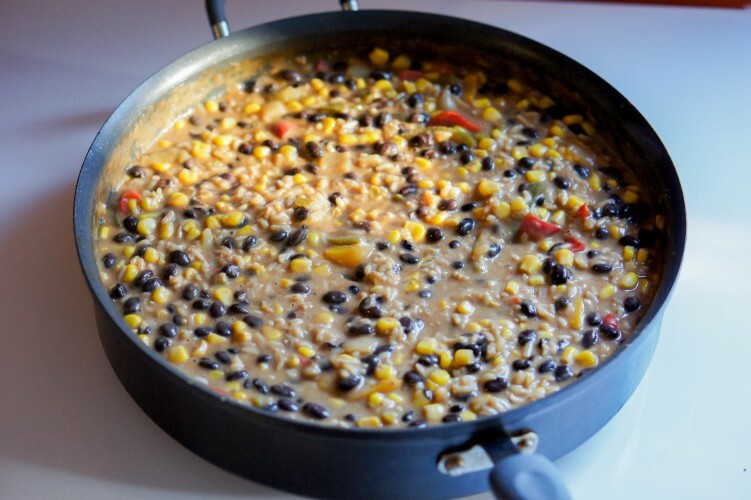 Stir in the black beans, corn, enchilada sauces, water, and seasoning and bring to a simmer. Reduce heat to low, cover, and cook for 20 minutes. Turn the heat off and let sit, still covered, for an additional 10 minutes. Stir in the cheese and enjoy. I promised my friend Cathy this recipe a few weeks ago when I snapped a picture of it to her. I’ve been lazy and keep putting it off, and it’s time to break out of yet another antisocial streak. I just can’t keep hiding from life, haha. Pregnancy hormones do weird things to people. Sorry I’ve been so absent! Anyway, this recipe fits my normal standards. It’s delicious, easy, and has very few ingredients. 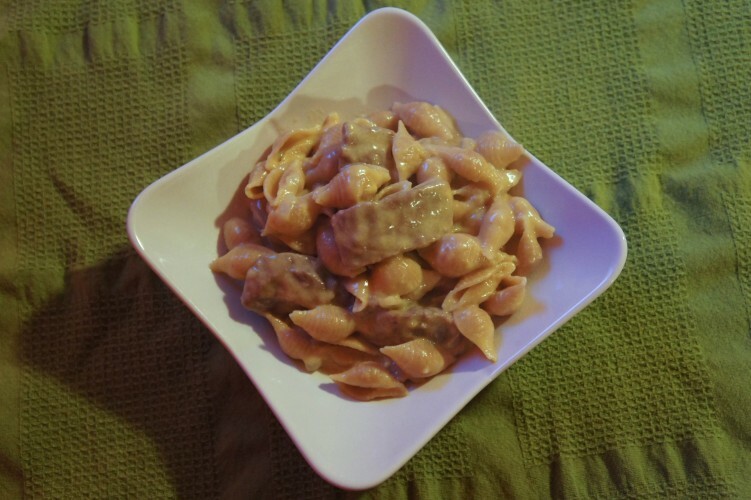 It’s perfect for a last minute, weeknight meal! I found it on Pinterest; it was a dead link photo with the recipe in the description. I shifted a few things around and have been making it regularly for over a year. 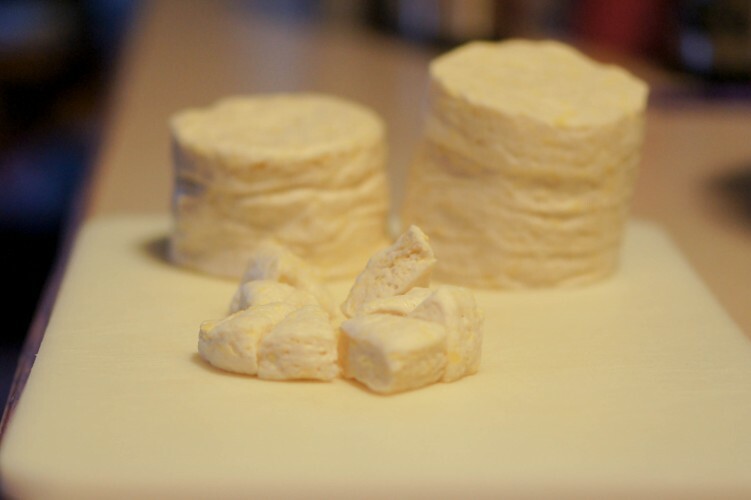 Besides being easy and delicious, it’s also really versatile. Don’t like pork? Use chicken instead. Not a fan of Italian Dressing? Ranch mix works just as well. I’ve also substituted broccoli for green beans, and both frozen and fresh of either vegetable works great. I’m sure there are more changes that could be made. Let me know if you come up with something brilliant! 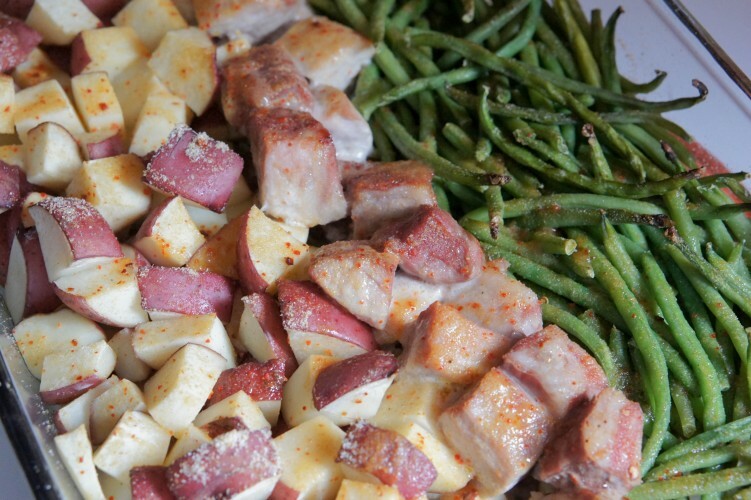 Cube the pork and potatoes. 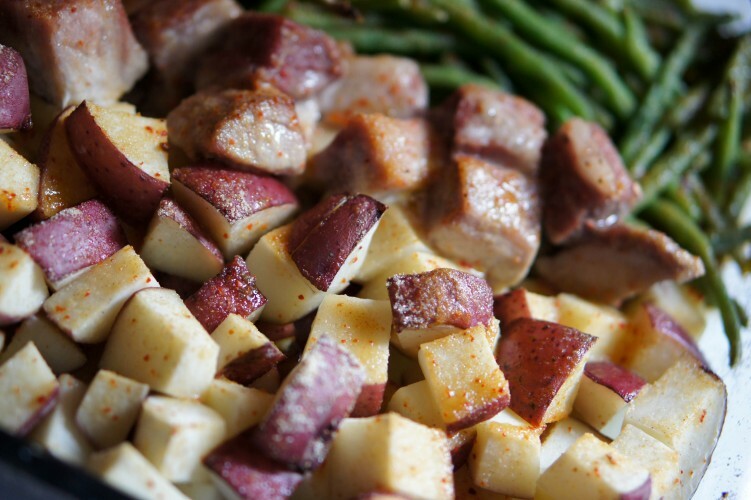 I usually cut my potatoes into smaller (about 1/2 inch) cubes so they get extra done. I like overcooked potatoes. 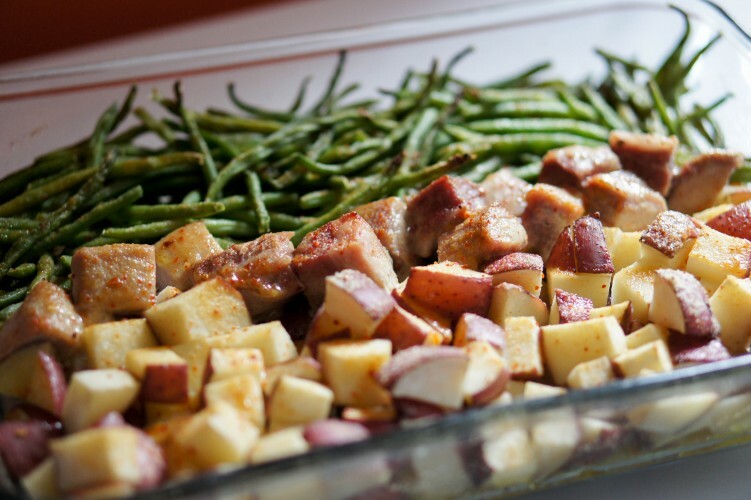 Arrange the green beans, potatoes, and pork in a sprayed baking pan. I usually do lines of each, but you could easily mix everything together. Sprinkle the Italian dressing mix over everything and pour the melted butter over that. Cover and bake for 45 minutes to an hour, until everything is fully cooked to your liking. 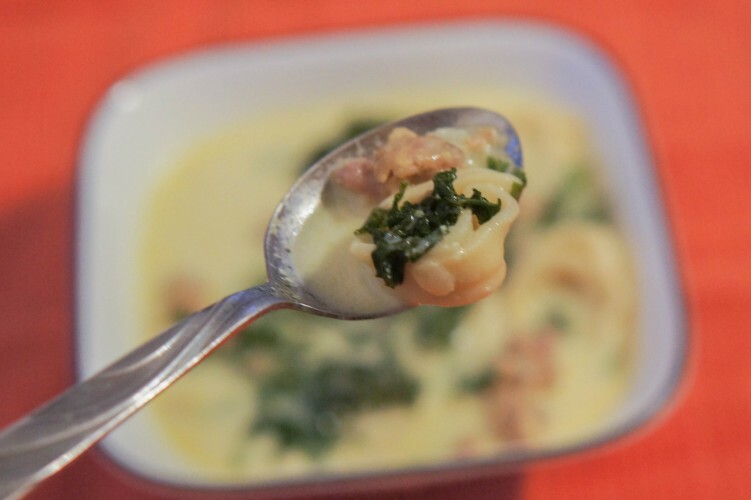 For a printable version of this recipe, click here!! It’s finally starting to get warm around here. 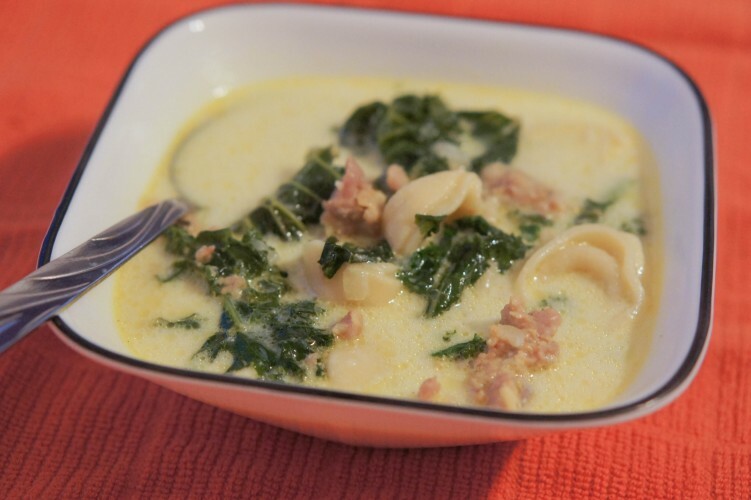 That means soup season is coming to an end, but I still have time to share at least one more soup recipe. At least I don’t think you guys will mind too much, right? 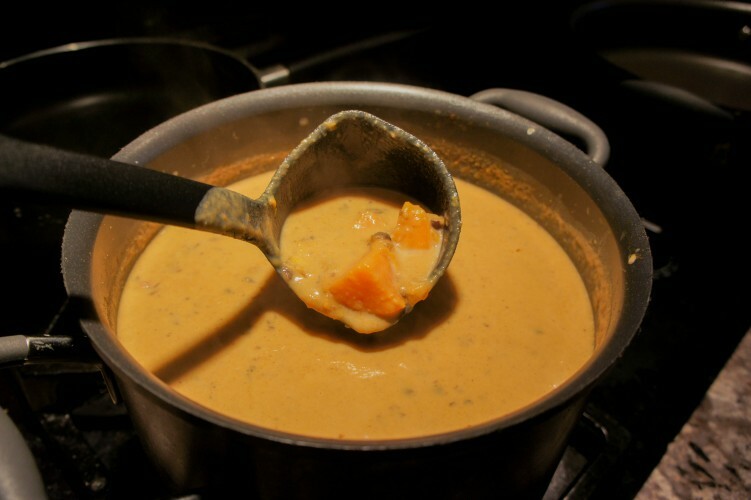 I love soup because it’s easy to make a lot, it’s inexpensive, it’s easy, and it’s delicious. I love cheap, easy, and delicious. 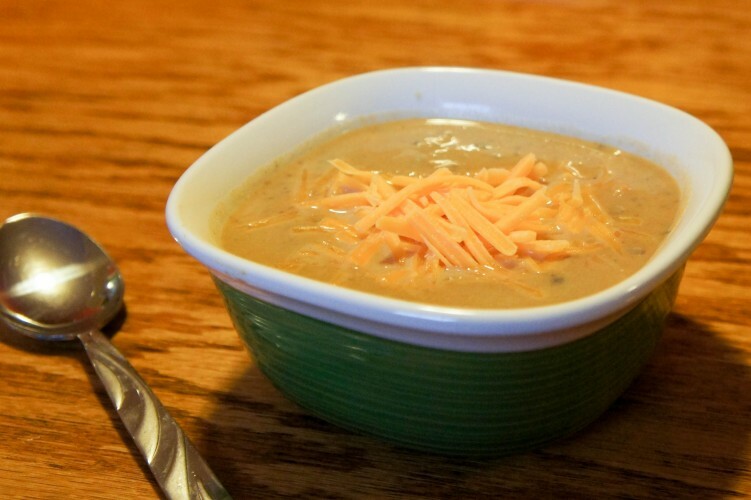 This soup takes less than a half hour from start to finish, has 6 ingredients (not including salt and pepper…), and is so delicious that the hubster asks for it all the time! What’s not to love about that, right? Heat the olive oil in a pan, add the sausage, and cook until no longer pink. Add the stock. 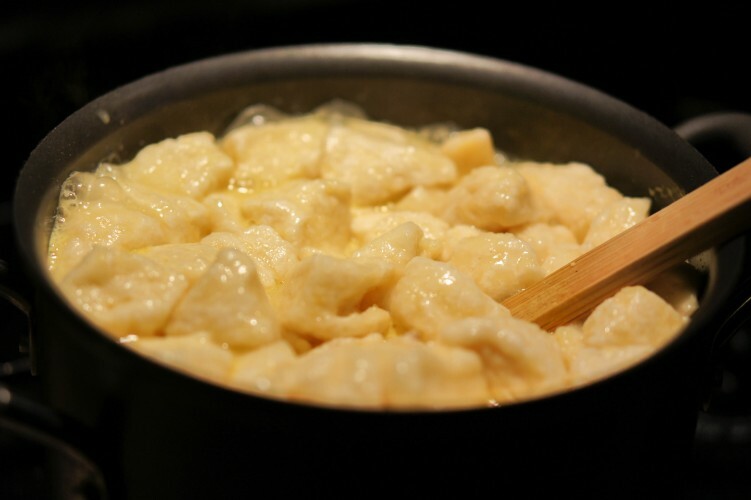 Once it boils, add the tortellini and boil until they float. Add the milk and the spinach and boil for a few more minutes. Spinach takes about a minute, which is less time than kale (5 minutes), so just cook until whatever greens you’re using are tender enough for you. Season with Salt and Pepper according to taste and enjoy! Wow, it’s been a busy few weeks. I turned 31 and this blog turned 2! Last Thursday was our second Blogiversary! I meant to make a post, but I didn’t have time (or motivation!) to do so. Instead, you get this Belated Blogiversary post! I just can’t believe I have stuck this out for two years. This blog has seen a few changes over the years, and it’s going to have more to come. I can’t promise to be consistent with posting (babies take a lot of time! ), but I can promise that I won’t give up completely. I wish I had a recipe for some kind of delicious cake. It seems fitting. Instead, I’m here with the complete opposite. 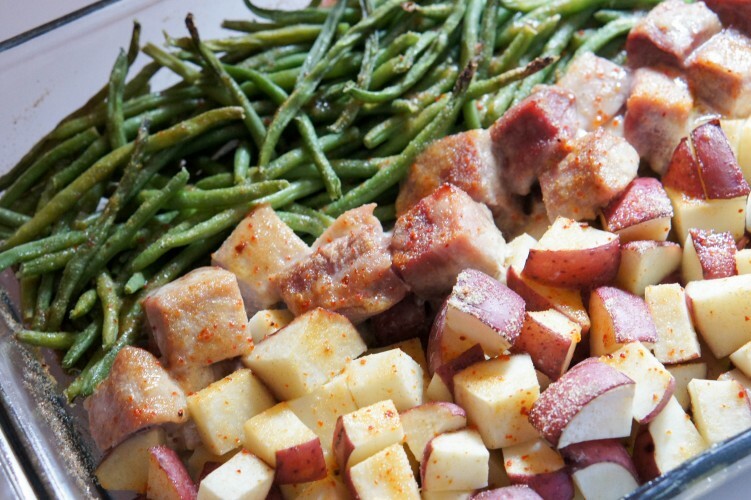 Need an easy weeknight dinner? This could be exactly what you’re looking for. 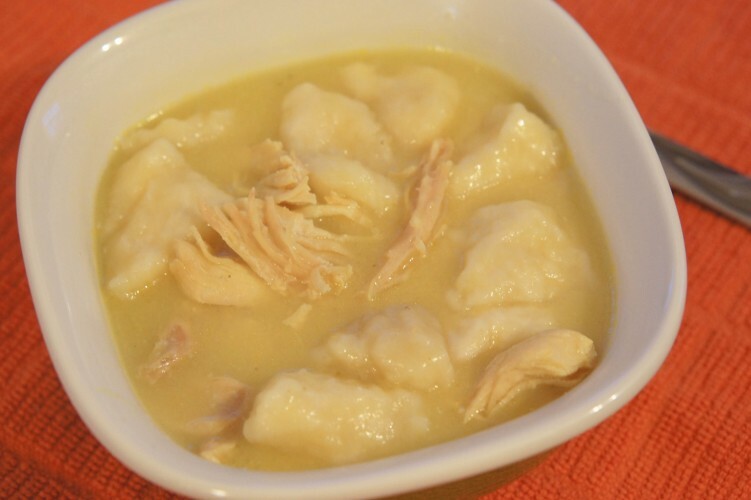 Chicken and dumplings are pretty delicious, but who has time to make that after working all day? Instead, try it this way. Yeah, it’s technically cheating, but cheating is fine when it comes to cooking sometimes. I usually have shredded, cooked chicken in my freezer. 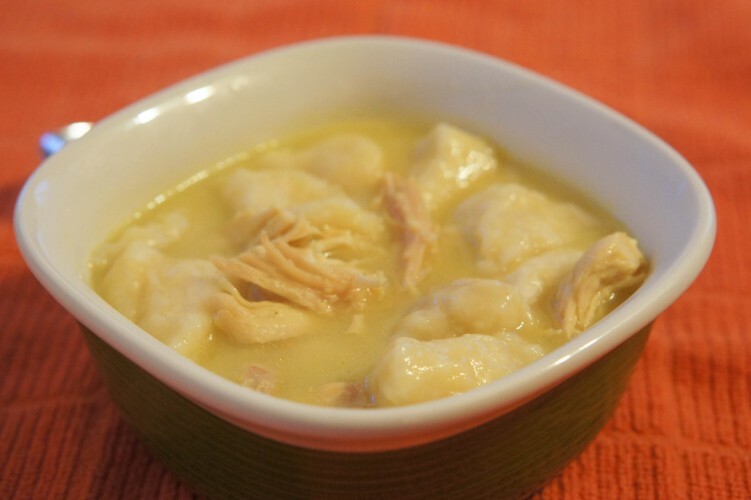 If you’re not crazy like me, you can bake a pound of chicken breasts or poach them in the stock you’re using in this recipe. Anyway you cook the chicken is fine. 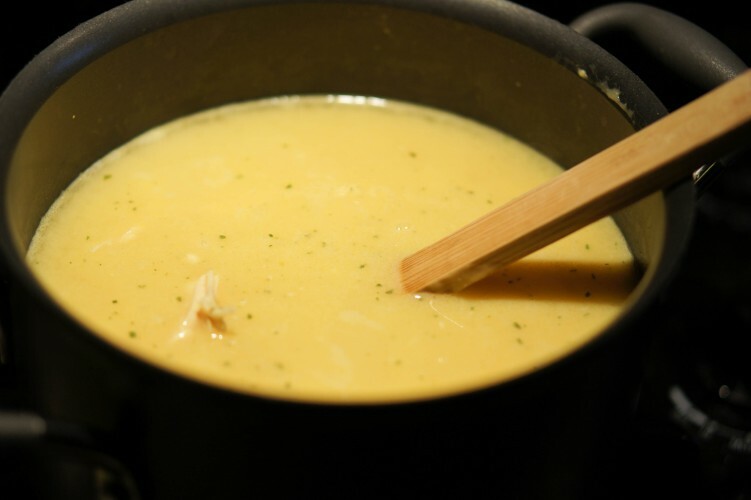 Combine the chicken, stock, and cream of chicken soup in a large stock pan and bring mixture to a boil. You can add veggies, too, if you want. Carrots, onions, celery, whatever. They’d all taste great! I just wanted to share the basic recipe. Feel free to build on it. While waiting for broth to boil, cut the refrigerated biscuits into 8 pieces each. Drop them into the boiling water, making sure to push them down into the broth so they don’t stick together. Let boil for 10 minutes to cook the biscuits. March will be here in two days, and it’s bringing more snow with it. That means soup season is being extended a little bit longer. 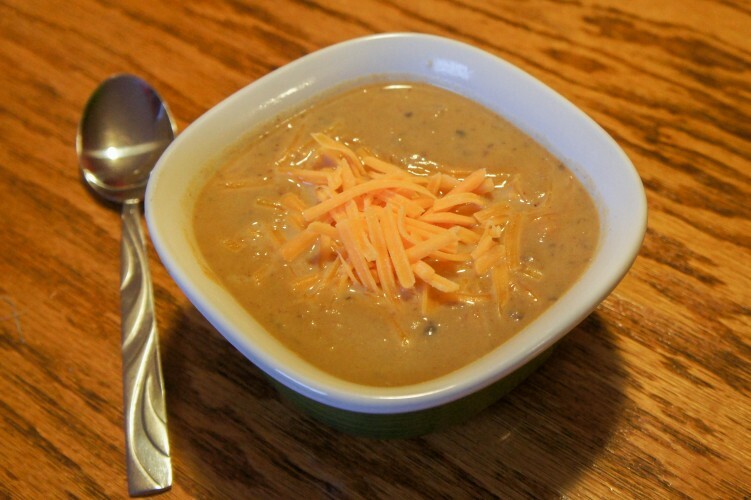 I’m here today to share with you one of our favorite, healthy soups for Meatless Monday. 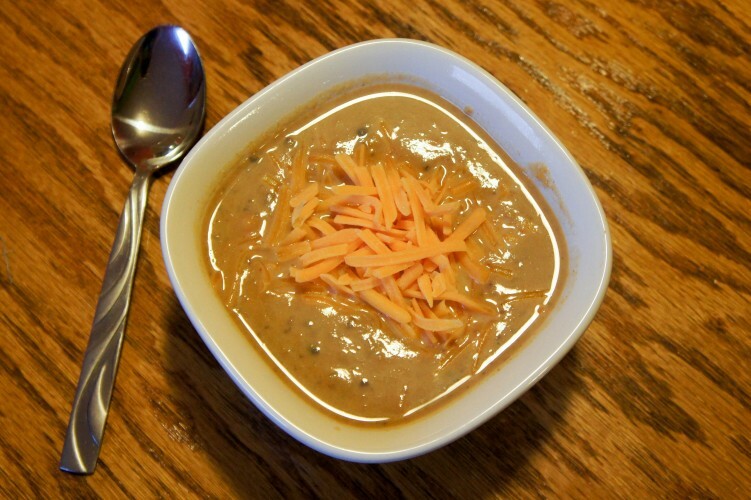 This Sweet Potato and Black Bean soup started out as this recipe Spicy Sweet Potato Soup I posted before. That soup is very, very delicious, but I wanted to make it meatless, add more protein, and streamline the cooking process a bit. 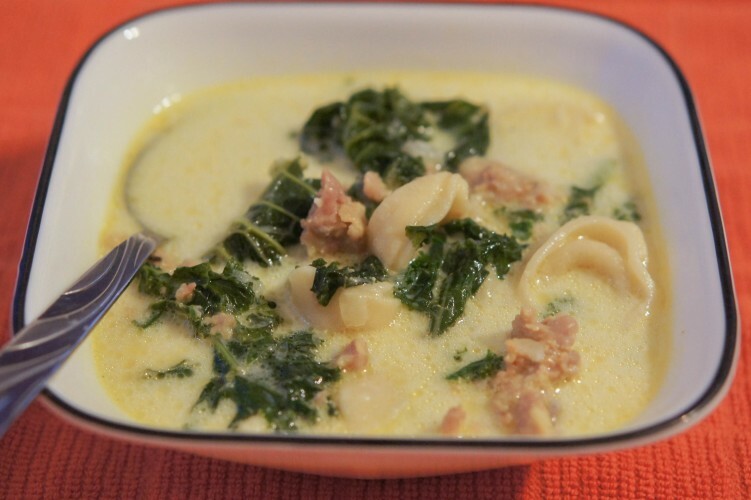 I ended up with this amazingly easy and delicious soup. Heat the olive oil in a pot, add the onion and cook until translucent. 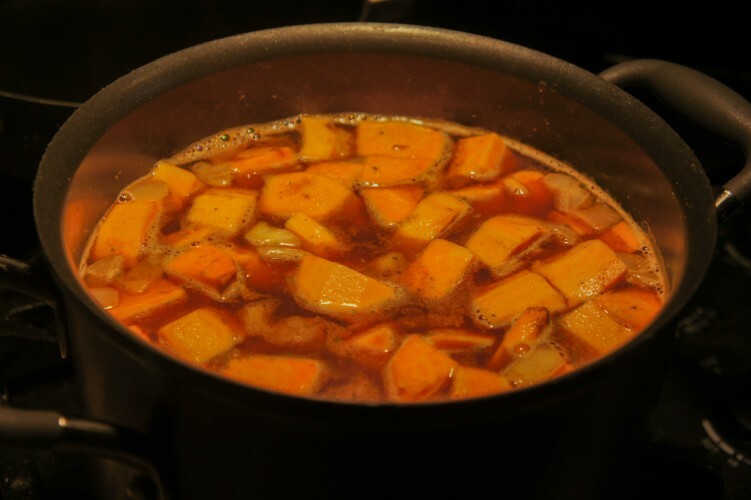 Add the sweet potatoes, black beans, broth, and spices. 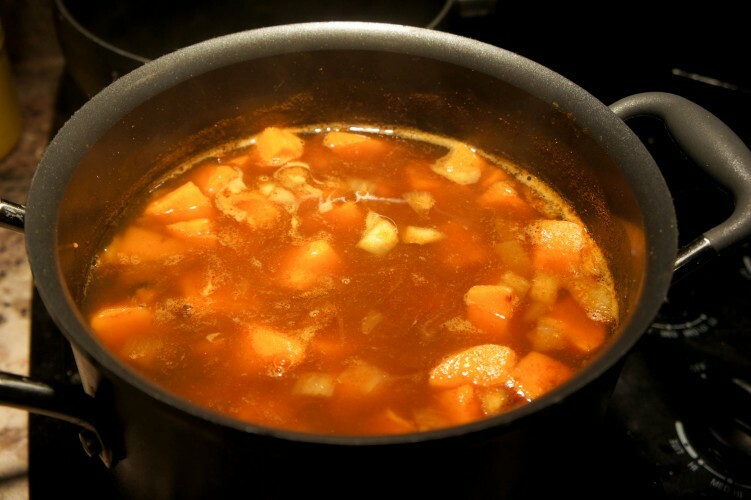 Bring the soup to a boil, and allow to simmer until sweet potatoes are tender. This should take about 10 to 15 minutes. At this point, I usually use my immersion blender to pulse it a bit, leaving a few pieces. We don’t like perfectly smooth soup here. You could definitely blend it all until smooth, too. Other options would be to put some of it in a blender or food processor or use a potato masher (thanks for that suggestion, Megan!). 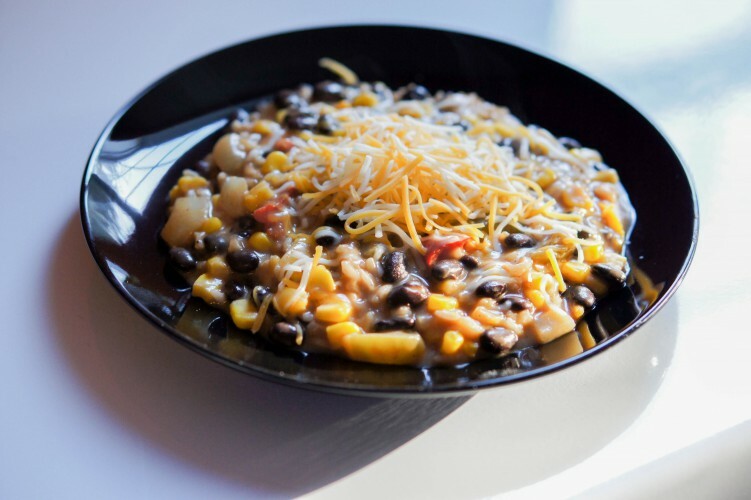 Serve hot with cheese, salsa, sour cream, or whatever else you’d like on top! 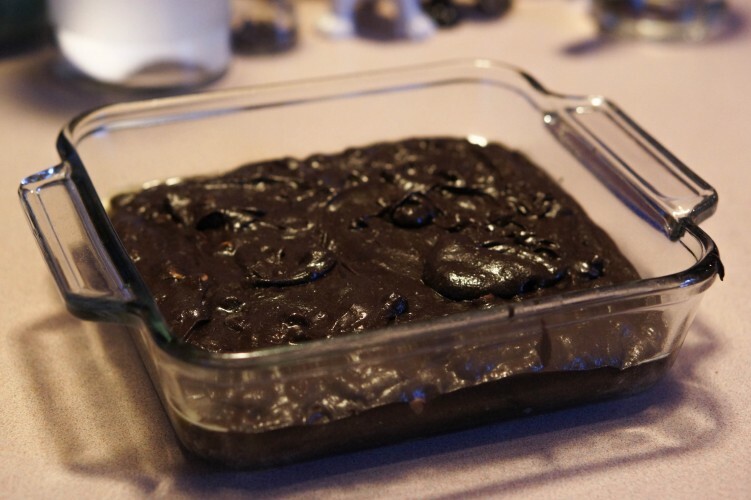 A few weeks ago, my friend Sarah mentioned that she made brownie pudding. I was immediately intrigued, and she gave me the recipe. I must be having severe preggo brain issues, because I lost the recipe soon after. It’s probably on my dessert pinboard, but I just overlooked it. I’ve been doing that a lot lately. I knew I had to make brownie pudding, though, so I did some googling and decided to use this recipe from Ina Garten as my starting point. I also knew I had to add peanut butter because the hubster loves peanut butter. The result was pretty delicious. I ate so much of it. I’m pretty disgusted with myself, but whatever. It was Valentine’s Day. The hubs and the kiddo both agreed that it was delicious, but really really sweet. 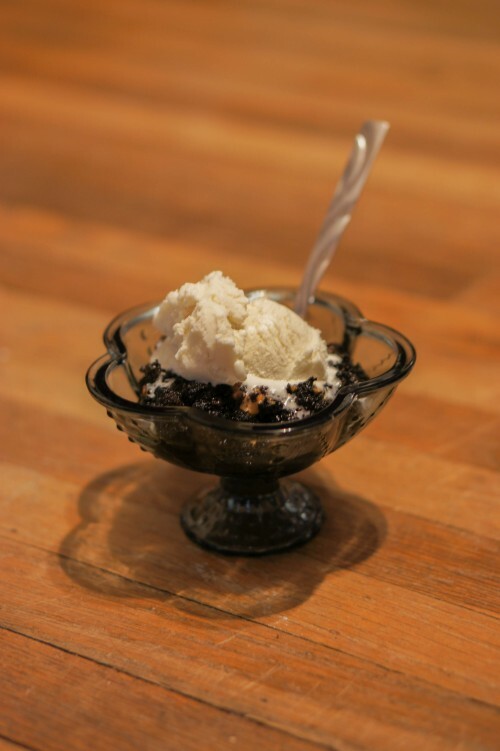 Neither of them could handle more than a small bowl due to the richness and sweetness. So, just keep that in mind when you make this! 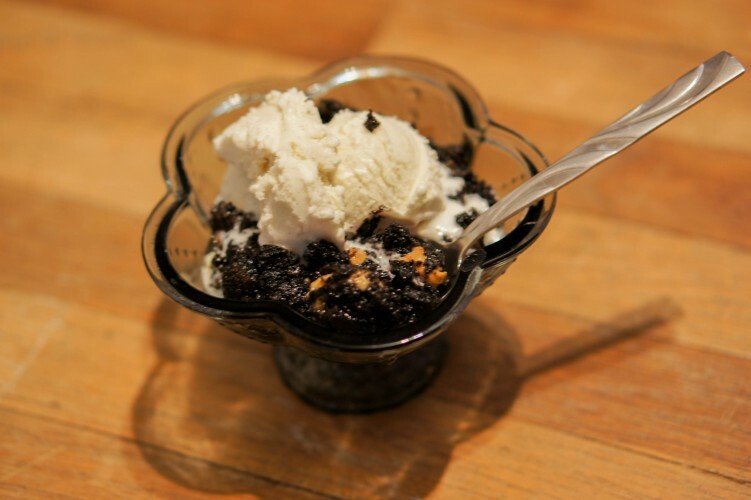 I guess I should explain what brownie pudding is, right? You’re all probably really curious! 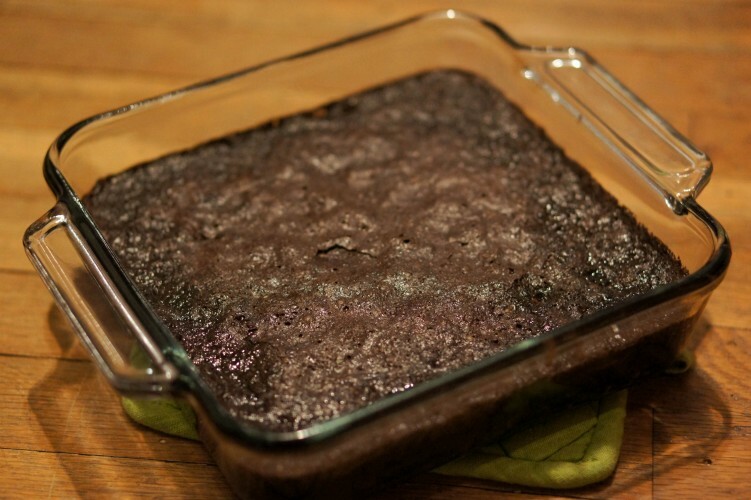 Well, it’s a bit like undercooked brownie batter, a mix between a brownie and pudding. It’s really hard to explain. It’s a bit like the difference between corn bread and spoon corn bread. Just trust me and try it. It’s delicious. I used peanut butter chips in this, but I think it would be pretty delicious without them… or with chocolate chips… or caramel chips. The possibilities are kinda endless, guys. It’s a totally customizable recipe. Oh! I also used half regular cocoa powder and half black cocoa powder. So, that added to the richness. Again, this is totally customizable. You can use regular, dark, black, whatever. 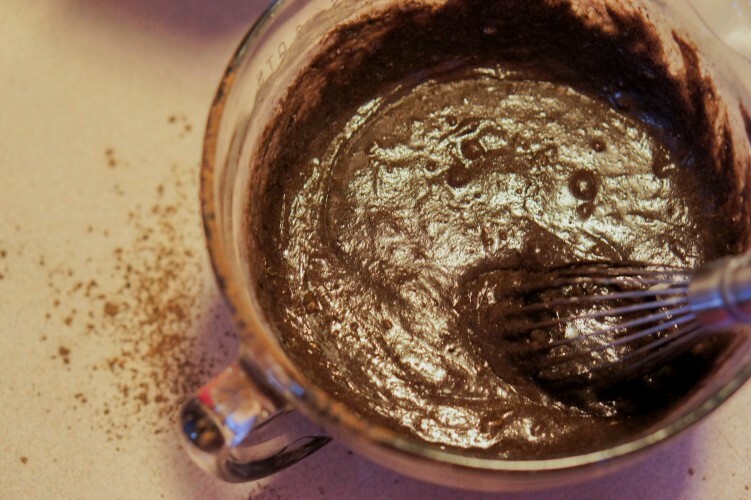 Just remember that black cocoa powder is really really alkaline. It doesn’t react the same way other cocoa powders do. So, you have to mix it with another kind. I try not to use more than half black cocoa powder in a recipe. That’s usually plenty, as you can tell from the amazing color of my brownie pudding. Mix together the eggs and the sugar until well combined. Add the cocoa powder, flour, and vanilla. Stir that until it’s just combined. Add the melted butter last, and, again, stir until just combined. Fold in the peanut butter chips and pour into a well greased baking dish. Place that baking dish inside a larger baking dish, and pour some water into the bigger one. Cover with foil and bake for 50-70 minutes, depending on your pan size. You’ll know it’s done when the edges are just set and the center is still gooey. I used an 8×8 pan, and it took 70 minutes, but, if you used a larger pan, it would spread out more and cook faster. Allow it to cool. It will continue to cook and set up a bit while it cools. 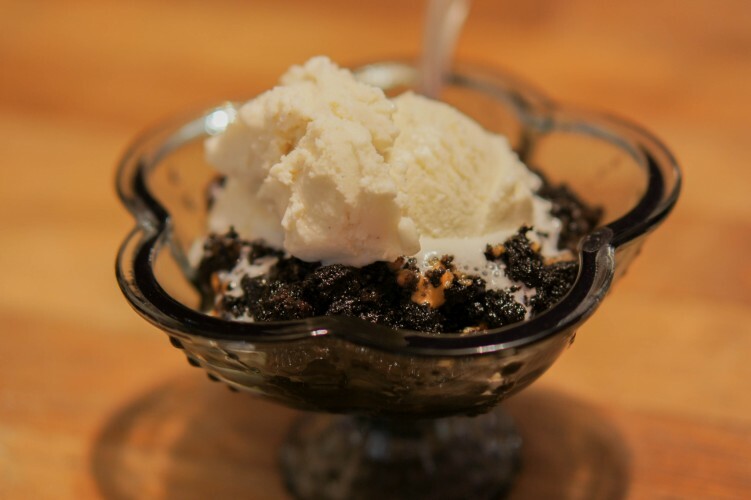 Scoop it out while it’s still a little warm and enjoy it with some vanilla ice cream or whipped cream. We’re in the middle of a major snow storm right now, and I am not a fan. I’m trying to keep myself busy with cooking, cleaning, reading, and posting. I’m way overdue for a post, anyway! I’m not going to apologize again, though. You guys already know I lack ambition. This recipe started as something I saw on Pinterest. I swore I had pinned it, but I couldn’t find it when it came time to make it. That means I just used the elusive pin as inspiration. How hard could it be to make a cheesesteak mac and cheese, anyway? Not very. 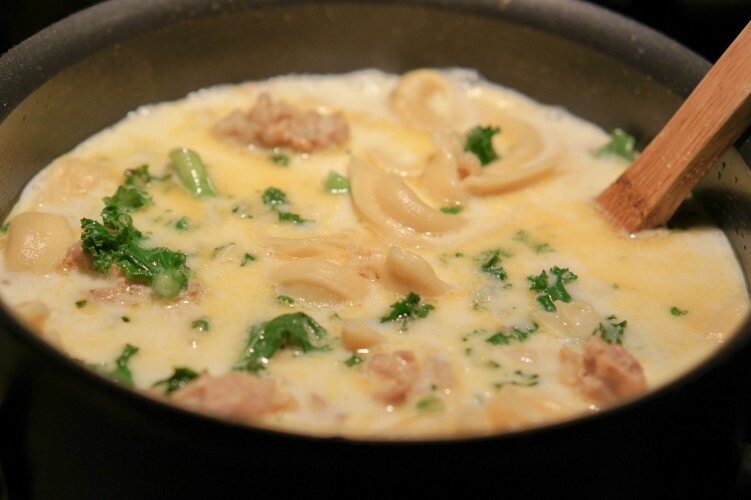 I adapted my basic cheese sauce recipe to create this Ah-mazing stovetop mac and cheese. I wish I had a bowl of it right now. It was so delicious. Can I take a moment to rant? Yes?? Thanks. I am so annoyed by the trend of using ‘Philly Cheesesteak’ as a buzzword. Half the recipes going around with that title are NOT Philly Cheesesteaks. Before you use the word ‘Philly’ answer these questions: Does it have ground beef? Does it use a cheese other than provolone, american, or cheese wiz? Does it contain anything other than meat, cheese, and onions? If you answered yes to any of those questions, please leave the ‘Philly’ off your title. I’ll stop now. It’s a pet peeve of mine. Does that make me a snob? Probably. I’m not concerned though. There are worse things to be snobbish about. On to the recipe, though! Heat the olive oil in a large skillet. Add the onion, garlic, and steak. 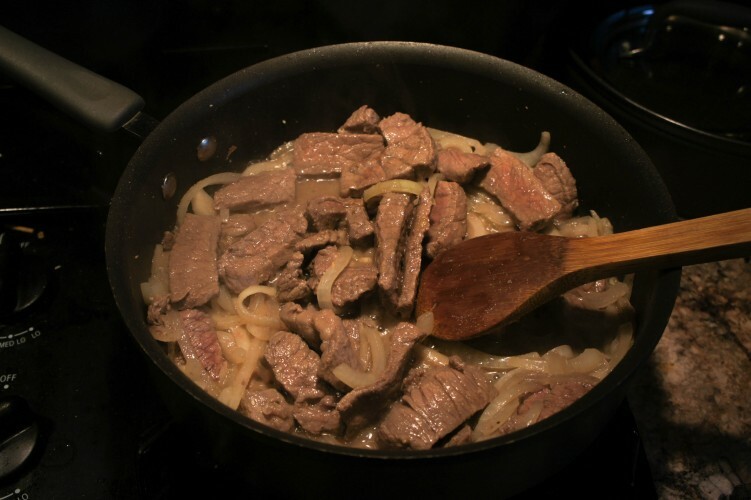 Season with salt and pepper and cook until steak is cooked to your taste. It cooks pretty fast, so watch out. 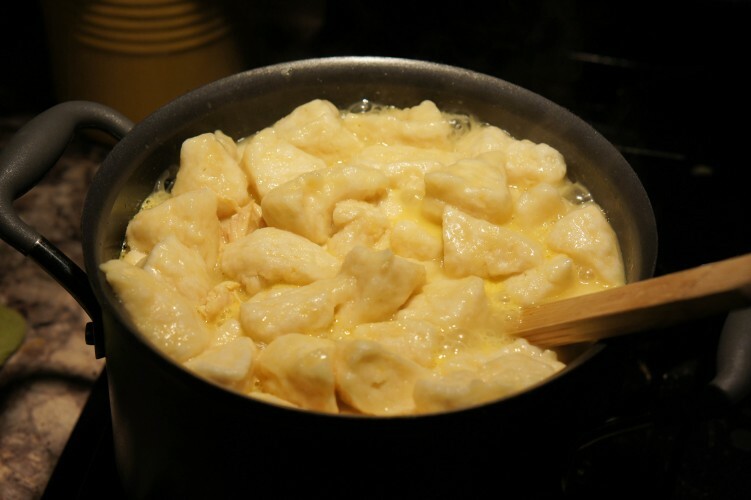 Stir in the flour, and allow mixture to cook a few minutes before slowly stirring in the milk. Bring to a boil and allow to simmer for a few minutes until it thickens a bit. 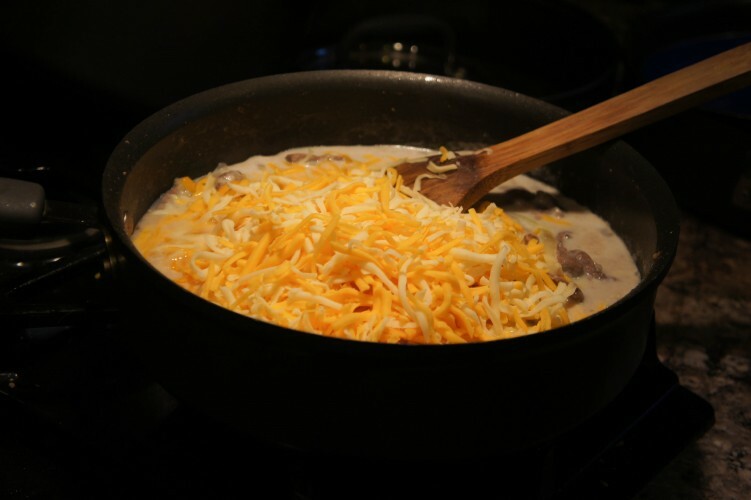 Stir in your favorite cheese. 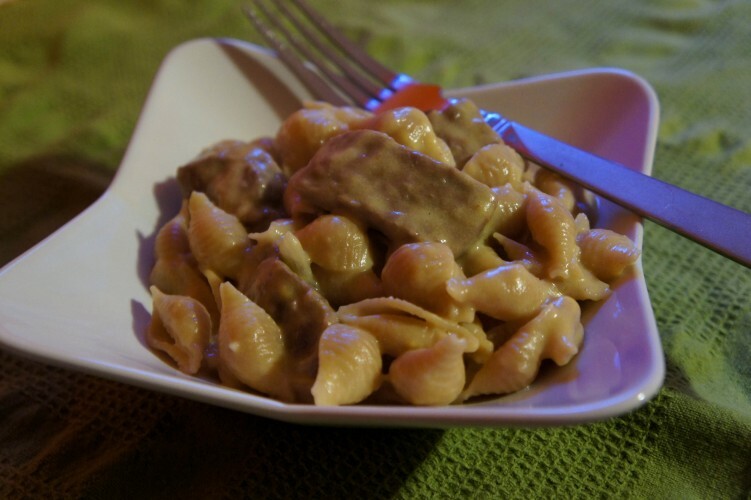 I used Colby-Jack, which is why this is not considered Philly Cheesesteak Mac and Cheese. 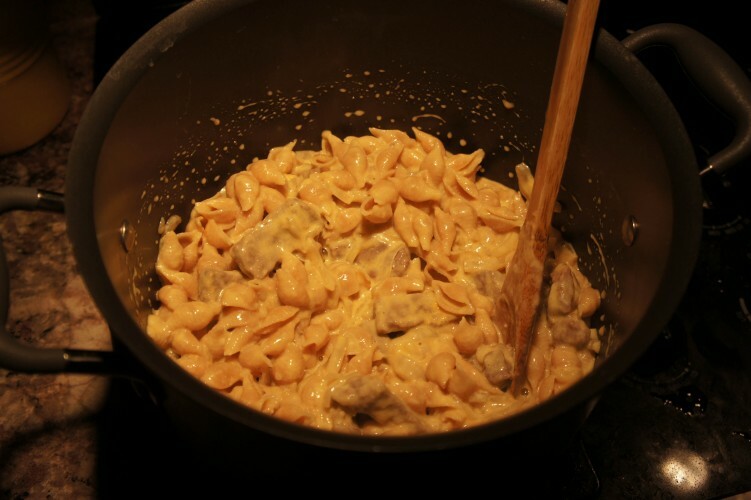 Add the cooked pasta and cheese sauce back into the large pan, and mix until combined. If you timed it correctly, everything should be done at once. That means it’ll be hot. If you have to wait for one or the other, you might need to heat it over low heat, stirring constantly, for a few minutes.